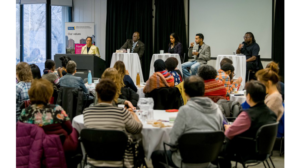 On March 12, 2018, the Ryerson University’s Office of the Vice President Equity and Community Inclusion held its Winter 2018 Soup and Substance session entitled: “Are Canadians Too Polite: Addressing Global Perspectives on White Privilege and Oppression in Canada and Beyond”, a discussion that was a precursor to the upcoming White Privilege Conference – Global in Toronto to be hosted at Ryerson University (May 9 – 12, 2018) [Register here: http://bit.ly/2r7LiLB]. 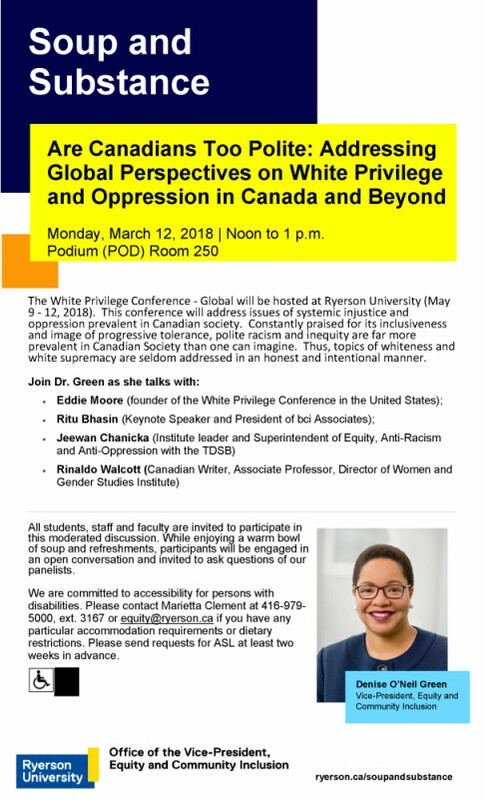 The White Privilege Conference (WPC Global – Toronto) will address issues of systemic injustice and oppression prevalent in Canadian society. In this Soup and Substance, the panel examines how topics of whiteness and white supremacy are seldom addressed in an honest and intentional manner, and they open the door for the great opportunity for colleagues and equity practitioners to engage openly in honest, critical, solutions-based discussions to address obstacles as they relate to issues that focus on and go beyond race at the conference.